Content is pretty much the lifeblood of B2B marketing. Many eCommerce companies don’t realise that content is also a crucial part of B2C marketing. Your product descriptions need to be kept fresh and you need to produce good content for your blog in order to rank highly in search engines and improve your social media presence. A blog also gives the opportunity to showcase your products and prove how trustworthy you are by showing your authority on the products which you sell. Basically blogging is a must. A magic formula to success if you will. It drives traffic, nurtures leads and increases your conversion rate. If you haven’t already got a blog, or your eCommerce content calendar has stalled a little, it can be difficult to think of fresh ideas to get going. Have no fear, we’re here to help! We’ve compiled 5 eCommerce content ideas to get your creative juices flowing and your fingers typing…so without further ado…here goes. A how-to video or blog post might seem most suitable for DIY products or kitchenware but it’s a great supplement to any product listing. So no excuses, get writing. It can be used to encourage customers to use your products for a range of purposes or just teach them the basic functionality – if it’s less obvious to the inexperienced customer. You can even create how-to content on choosing the perfect gift for a family member or friend. An example of a brand that does fantastic how-to content? Stumptown Coffee Roasters. They produce guides which explain all of the different brewing methods which you can use to make the perfect cup of coffee. Why do they produce these guides? It drives traffic to their website, supports their SEO efforts, tells visitors how to brew their products (super darn helpful) and ultimately increases conversions. Sell a range of products from one or more categories? Why not offer up detailed product reviews and demos on your blog? You might not want to choose one product as being the overall preferred choice from one category but you can choose the best products for certain requirements and situations. Not only does it show you have authority in the industry but also improves the customer experience, by helping them to buy the right product. If you are already providing user generated reviews (by the way, you SHOULD be doing this), then you could always draw out some of these reviews. Maybe list your top performing products based on user reviews in an infographic. Or make a comprehensive guide for picking the perfect product for a reader’s need. “How to pick the right…” is super helpful and sure to be a SEO hit! Got an awesome brand advocate or someone that has done something new or interesting with the help of your products? Creating a case study or some other form of content around that person or business is the perfect way to show off the versatility of your products and show how much your customers mean to you. Case studies of happy customers also create trust for potential buyers. A customer doing something amazing with your product is an excellent review, and what better way to show off an excellent review than to feature it on your blog? We produce case studies of our clients and they receive excellent engagement. They build awareness of our services, teach potential leads about what we can achieve and (again) they are great for increasing our rank for keywords in Google. Can’t beat a good infographic, can you? Usually used to display data in an eye-catchy manner but you can also use them to provide perfect product recommendations or display user reviews. Figure out which of your products work perfectly together, and tell your customers about it. Infographics are perfect for conveying information visually; if you are a clothing retailer you can show off some outfits. If you are an electronics company you can easily explain compatibility of different devices. Infographics are a fun way for your customers to learn more about your products and it encourages them to buy a variety of products from across your site. Need a little content or design inspiration for your infographic? Head over to Daily Infographic to get an infinite supply of the stuff. Local, national or international event coming up? Connecting your products to a trending event through content gives your site an influx of fresh traffic. Trending topics often get high social shares and if the content is truly relevant, it can also increase sales. Our client Predator Nutrition produces some excellent content and they recently published such a blog post revolving around the Tour de France. Events to share eCommerce content on can be seasonal, national holidays, sporting or even events a little closer to home. Whilst not a real product (not just yet anyway), Burger King did an excellent job of tapping into World Peace Day chatter with the McWhopper campaign. 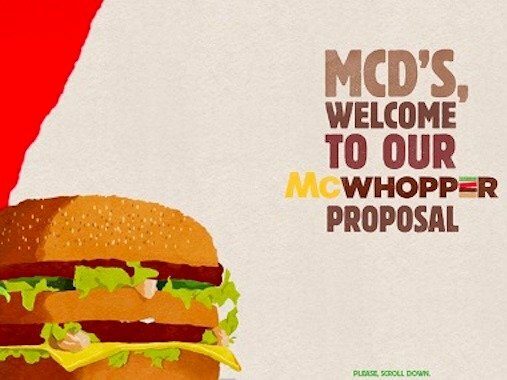 Burger King extended a co-branded olive branch to fast food rival McDonald’s, offering to “Settle The Beef” with a one-day partnership in honor of World Peace Day on September 21st. From a marketing perspective, it was a runaway success. So there’s 5 fresh eCommerce content ideas to get you thinking and get you typing, recording, designing and generally creating. We hope they help! If you are already a bit of a content whizz, then feel free to add some more suggestions in the comments box below. Are you interested to find out how many leads and sales you could earn with our managed chat services? Find out what we could deliver for you with our free live chat ROI calculator.